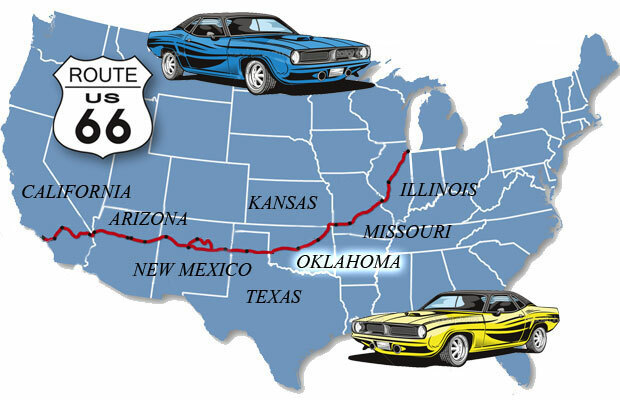 Oklahoma containing more still-drivable miles of the route 66 than any other state, makes it definitely a mecca for old-roads fans. Not long but a century ago this was still Indian Territory, and last refuge of Apache, Comanche, and other tribes before the government took even this land away from them. The state’s name derives from the Choctaw phrase okla-humma, and means red people. The geography of the state is very diverse, and as you move forward, you will start to notice how the landscape evolves and changes from partial plains interrupted by small mountain ranges, lakes and natural forests, to the first arid plains and deserts. Oklahoma is also the epicentre of the country’s infamous “tornado alley” being often the hub of very violent tornadoes and thunderstorms during the spring and summer seasons. The cost of living, including the cost of tourist related activities, are lower than nearly anywhere else in the USA, making it a great place to live and visit. The largest McDonald’s in the United States : Location – Vinita. It might be worth a visit even if you are against the fast food giant, just for the sake of curiosity of its enormity. Totem Pole Park : Location – Foil. You will find there a giant, world record holding totem of over 27 meters built in 1948 by a Missouri woodcarver who devoted it his entire retirement, from 1937 until his death in 1962. The J.M. Davis Gun Museum: Location – Claremore. The world largest private collection of guns showcasing weapons makes from around the world, and models that belonged to famous criminals like the Dalton Brothers or Bonnie and Clyde. The Rock Cafe: Location – Stroud. It was built with the surfacing stones of Route 66 in 1939 and later destroyed by fire. In 2008 it was rebuilt by Dawn Welch who also inspired the character of “Sally” to the screenwriters of “Cars”. The first oil well in Oklahoma: Location – Chelsea.These wells dug in 1889 were dwarfs compared to the monsters built today up to 30000 feet deep. The Blue Whale: Location – Catoosa. The Blue Whale and its pond became an inevitable stop for the adventurers of route 66, and was a favoured swimming hole for both, locals and travellers. The Round Barn: Location – Arcadia. Built in 1898, nowadays stands as a historic icon. Its unusual round shape offers less grip to many tornadoes sweeping the region. It also offers outstanding acoustics and can be rented for various private events. Pops: Location – Arcadia. This place offers the largest variety of soft drinks in the whole world.You can choose from more than 500 different sodas from all over the world. Grand Lake of the Cherokees: Location – 29 miles, 30 min from Miami, OK. It’s a Pensacola Dam project completed in 1940 and is one of the most popular lake destinations in Oklahoma. 1,300 miles of this serpentine gems’ scenic shoreline, bordered by five state parks, make the Grand Lake Area an outdoor lovers’ paradise. Attraction – Hiking, Biking, Fishing, Boating, Swimming, Horse Riding, Camping. Natural Falls State Park: Distance – 78 miles, 1 h 15 min from Tulsa, OK. A quiet oasis in north-eastern Oklahoma with a 77-foot waterfall inviting travellers to trek down the rugged trails to an enchanting basin pool. The area surrounding the waterfall, is one of the most beautiful locations in all of Oklahoma. Locally known as Dripping Springs. Attractions – Camping, Hiking, Biking, Caving, Horse riding, Swimming Holes. Wichita Mountains Wildlife Refuge: Distance – 95 miles, 1 h 30 min from Oklahoma City, OK. Wichita Mountains are home to American bison herds, Texas Longhorn cattle, bobcats, prairie dogs and coyotes. From the top of Mount Scott you can enjoy the view of patched landscape of lakes, amazing rock formations and never ending picturesque hiking trails. Attractions – Rock Climbing, Hiking, Mountain-Biking, Camping, Fishing, Hunting, Bird & Wildlife Watching. Beavers Bend & Hochatown State Park: Distance – 247 miles, 4 h from Oklahoma City, OK. Mountains of pine forests intermingled with colourful hardwood trees and cool, crystal clear waters for enthusiasts of fishing. Attractions – Scuba Diving, Camping, Hiking, Biking, Kayaking, Fishing. Little Sahara State Park: Distance – 145 miles, 2 h 30 min from from Oklahoma City, OK. Little Sahara takes its name after 1,600 acres of sand dunes, with some of them reaching 75 feet in hight. Attractions – Dune Buggies, Motorcycles, Jeeps & ATVs riding. Black Mesa State Park and Nature Preserve: Distance – 382 miles, 7 h from Oklahoma City, OK. Quite a long side trip located in the farthest north – west corner of Oklahoma, but it might be worth an effort for its epitome of stark beauty. It features The Black Mesa plateau, amazing wildlife, including big-horn sheep, golden eagle and black bear. Remoteness of it makes it a great place to leave the rest of the world behind. Attractions – Hiking, Biking, Horseback Riding, Nature Watching. Robbers Cave State Park: Distance – 160 miles, 2h 40 min from Oklahoma City, OK. Famous for being a hideout for outlaws Jesse James and Belle Starr. Panoramic views of the lakes and hilly woodlands of the Sans Bois Mountains, make it a little heaven destination for nature lovers. Attractions – Fishing, Camping, Hunting, Horseback Riding, Mountain Biking, Climbing, Swimming, Boating.